American DJ Royal 3D II Projection Lighting Effect DJParts - All Variety of Parts that DJ Needs. 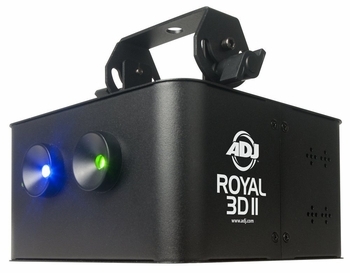 The new ADJ Royal 3D II features a new case design and new dynamic programs for pure lighting excitement. This intelligent laser features one 30mW green and one 350mW blue laser. Its beams rotate back and forth creating amazing aerial effects on a ceiling, a wall, or projected over a crowd. Perfect for small clubs or the entertainer on the go! Just turn it on and let it run in sound active mode through its 15 exciting built-in programs, or program your own light show with one of ADJ DMX lighting controllers. Link up to 14 units using 3-pin XLR Connectors and IEC In/Out power cables to create an awesome shower of green and blue laser beams. The Royal 3D II has 5 DMX channels, 3 operational modes (DMX, Sound Active, or Master/Slave), has a wide 90-degree beam angle, and only consumes a maximum of 22.5W of power. Users can also use the UC3 easy-to-use controller with the Royal 3D. This laser is FDA approved.